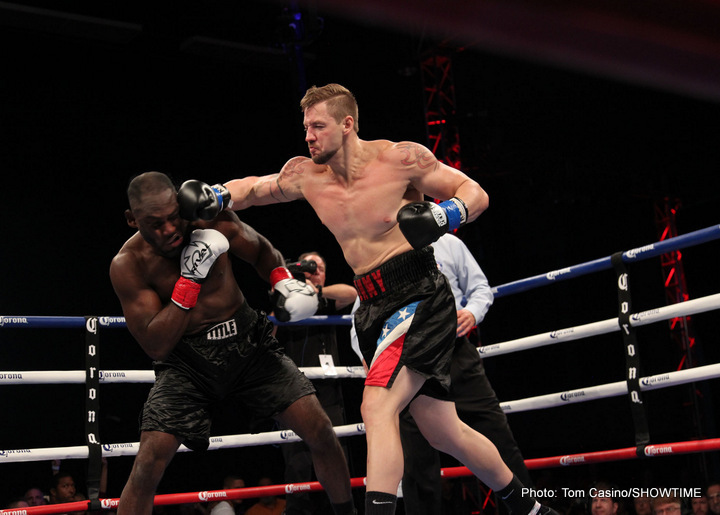 Currently carving out his own name as a heavyweight contender is Trey Lippe Morrison, son of the late Tommy Morrison. The unbeaten 27-year-old is now 12-0(12) and Morrison is coming off an impressive one-round stoppage win over Ed Latimore. The Latimore fight, which was Morrison’s Showtime debut, was supposed to be his toughest test to date in a pro career that began in February of 2014, instead Morrison got the September fight done and dusted in quick time. Next up for the Freddie Roach-trained puncher will be a December 10 fight in Miami, Oklahoma (scene of Morrison’s last three bouts) and his scheduled opponent is 41-year-old Texan, Ty Cobb. Cobb, 19-7(11) has been in with a number of big names, including Deontay Wilder, Chazz Witherspoon and Artur Szplika, but they have all made short work of him. Morrison should have no trouble picking up his 13th KO win next month. Still, Morrison is training hard at The Wild Card gym, sparring, amongst others, cruiserweight champ Denis Lebedev. Morrison, who is powerful and exciting, is certainly a young heavyweight to keep an eye on. The big problem he might have to overcome, though, is his size; Morrison standing just 6’2” in today’s land of heavyweight giants. Still, some people, Roach included, feel the son of a champion can become a champ himself. It’s still early days, and it’s not clear what the Cobb fight will do for Morrison other than get him one more fight in before the end of the year, but Morrison is working hard to do his late father proud. Yet to be extended beyond the fourth round, Morrison looks set to win quickly again on December 10.